North Asia or Northern Asia (Russian: Северная Азия, lit. 'Severnaya Aziya'), sometimes also referred to as Siberia or Eurasia, is partly a subregion of Asia, consisting of the Russian regions east of the Ural Mountains: Siberia, Ural and the Russian Far East. The region is sometimes also known as Asian Russia (as opposed to the smaller but more densely populated European Russia to the west). North Asia is bordered to the north by the Arctic Ocean, to the west by Eastern Europe, to the south by Central and East Asia and to the east by the Pacific Ocean and North America. North Asia covers an area of approximately 13,100,000 square kilometres (5,100,000 sq mi) or 8.8% of the earth's land area, or 1.5 times the size of Brazil. It is the largest subregion of Asia by area, but is also the least populated, with an approximate total population of only 33 million people or 0.74% of Asia’s population. North Asia is solely administrated by Russia, and makes up more than 75% of the territory of the country, but only 22% of its population, at a density of 2.5 people per km2 (6.5 per sq mi). The region of Western Siberia and occasionally Kazakhstan is usually called Northwestern Asia or Northwest Asia; (Russian: Северо-Западная Азия, lit. 'Severo-zapadnaya Aziya'), although the name sometimes refers to Caucasus or nearby provinces. Topographically, the region is dominated by the Eurasian Plate, except for its eastern part, which lies on the North American, Amurian and Okhotsk Plates. It is divided by three major plains: the West Siberian Plain, Central Siberian Plateau and Verhoyansk-Chukotka collision zone. 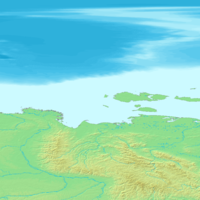 The Uralian orogeny in the west raised Ural Mountains, the informal boundary between Europe and Asia. Tectonic and volcanic activities are frequently occurred in the eastern part of the region as part of the Ring of Fire, evidenced by the formation of island arc such as Kuril Islands and ultra-prominent peaks such as Klyuchevskaya Sopka, Kronotsky and Koryaksky. 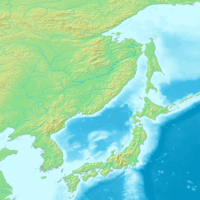 The central part of North Asia is a large igneous province called the Siberian Traps, formed by a massive eruption occurred 250 million years ago. European influences, especially Russian, are strong in the southwestern and central part of the region, due to its high Russian population from Eastern Europe which began to settle the area in the 18th-century CE. The southeastern part is historically under the influence of East Asian cultural sphere, especially the Chinese. Indigenous cultures are mostly strong in the eastern and southern part of the region due to concentrated population of indigenous ethnicities. In recent years there are growing number of movements by the indigenous peoples of the region to preserve its culture from extinction. The region is the home of different peoples such as Turkic, Tungusic and Uralic peoples. The region was started to be populated by hominins in the Late Pleistocene, approximately 50,000 years ago, With the first humans arriving in the region having West Eurasian origins. Its Neolithic culture is characterized by a characteristic stone production techniques and presence of pottery of eastern origin. Bronze Age began during the 3rd-millennium BCE, with influences of Indo-Iranian cultures as evidenced by Andronovo culture. During the 1st-millennium BCE, polities such as the Scythians and Xiongnus emerged in the region, whom often clashed with its Persian and Chinese neighbors in the south. The Turkic Khaganate dominated the southern Siberia during the 1st-millennium CE, while, in early 2nd-millennium CE, the Mongol Empire and its successor states ruled the region. The Khanate of Sibir was one of the last independent Turkic state in North Asia before its conquest by Tsardom of Russia in 16th-century CE. Russia would then gradually incorporate the region into its territory until the Convention of Peking was signed in 1860. After the October Revolution in 1917, the region was contested between the Bolsheviks and Whites until Soviet Union asserted full control in 1923. The collapse of Soviet Union in 1991 left Russia as the administrator of the region. For geographic and statistical reasons, the UN geoscheme and various other classification schemes will not subdivide countries, and thus place all of Russia in the Europe or Eastern Europe subregion. The plateau and plains of Northern Asia comprise the West Siberian lowlands; the Angara Shield, with the Taimyr Peninsula, the coastal lowlands, the Putorana Plateau, the Anabar Plateau, the Tunguska Plateau, and the Angara Plateau; and the Lena–Vilyuy Basin. Western Siberia is usually regarded as the Northwest Asia, Kazakhstan also sometimes included there. But Northwest Asia sometimes refers to Caucasus or nearby provinces. Most estimates are that there are around 33 million Russian citizens living east of the Ural Mountains, a widely recognized but informal geographical divide between Europe and Asia. The native Turkic, Uralic and Tungusic peoples now are a minority in North Asia due to the Russification process during the last three centuries. Russian census records indicate they make up only an estimated 10% of the region's population with the Buryats numbering at 445,175, which makes them the largest ethnic minority group in Siberia. There are 443,852 Yakuts (Russian Census of 2002) living in Russian Far East. According to the 2002 census, there are 500,000 Tatars in Siberia, but 300,000 of them are Volga Tatars who settled in Siberia during periods of colonization. Other ethnic groups that live in the region and make a significant portion are ethnic Germans and they number about 400,000. In 1875, Chambers reported the population of Northern Asia to be 8 million. Between 1801 and 1914, an estimated 7 million settlers moved from European Russia to Siberia, 85% during the quarter-century before World War I. ^ Vishnevsky, Anatoly (15 August 2000). "Replacement Migration: Is it a solution for Russia?" (PDF). EXPERT GROUP MEETING ON POLICY RESPONSES TO POPULATION AGEING AND POPULATION DECLINE /UN/POP/PRA/2000/14. United Nations Population Division, Department of Economic and Social Affairs. pp. 6, 10. Retrieved 2008-01-14. ^ Haywood, A. J. (2010). Siberia: A Cultural History. Oxford University Press. ISBN 9780199754182. ^ Kotkin, Stephen; Wolff, David (2015-03-04). Rediscovering Russia in Asia: Siberia and the Russian Far East: Siberia and the Russian Far East. Routledge. ISBN 9781317461302. ^ King, Alexander David (2011-06-01). Living with Koryak Traditions: Playing with Culture in Siberia. U of Nebraska Press. ISBN 978-0803235090. ^ Minahan, James B. (2014-02-10). Ethnic Groups of North, East, and Central Asia: An Encyclopedia. ABC-CLIO. ISBN 9781610690188. ^ Golovnev, Andrei V.; Osherenko, Gail (2018-09-05). Siberian Survival: The Nenets and Their Story. Cornell University Press. ISBN 9781501727221. ^ Gray, Patty A.; Gray, Patty (2005). The Predicament of Chukotka's Indigenous Movement: Post-Soviet Activism in the Russian Far North. Cambridge University Press. ISBN 9780521823463. ^ "World's oldest needle found in Siberian cave that stitches together human history". siberiantimes.com. Retrieved 2018-09-30. ^ a b Kılınç, Gülşah Merve; Kashuba, Natalija; Yaka, Reyhan; Sümer, Arev Pelin; Yüncü, Eren; Shergin, Dmitrij; Ivanov, Grigorij Leonidovich; Kichigin, Dmitrii; Pestereva, Kjunnej (2018-06-12). "Investigating Holocene human population history in North Asia using ancient mitogenomes". Scientific Reports. 8 (1): 8969. Bibcode:2018NatSR...8.8969K. doi:10.1038/s41598-018-27325-0. ISSN 2045-2322. PMC 5997703. PMID 29895902. ^ Dupuy, Paula Doumani (2016-06-02). "Bronze Age Central Asia". doi:10.1093/oxfordhb/9780199935413.001.0001 (inactive 2019-02-23). ^ a b William Chambers and Robert Chambers (1875). Chambers's Information for the People. London and Edinburgh: W. & R. Chambers. pp. 274–276. ^ a b c d e f g h Edwin Michael Bridges (1990). "Northern Asia". World Geomorphology. Cambridge University Press. pp. 124–126. ISBN 978-0-521-28965-8. ^ "31. Численность населения городов и поселков городского типа по федеральным округам и субъектам Российской Федерации на 1 января 2017 года". Russian Federal State Statistics Service. Retrieved 10 May 2018. ^ "Russia: Federal Districts and Major Cities". Citypopulation.de. Retrieved 26 March 2018.